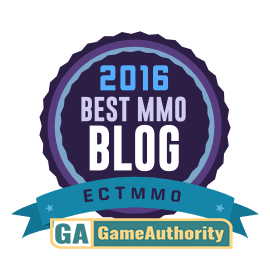 ECTmmo.com- MMO Blog: The Adventures of Kaozz...: LoN= More EQ & EQ2 Welcome Back Goodies! 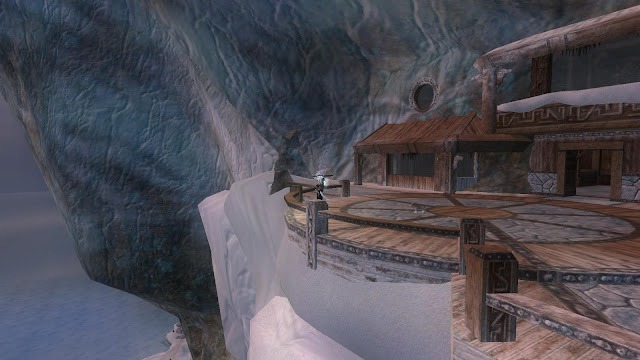 LoN= More EQ & EQ2 Welcome Back Goodies! Last night a friend of mine excitedly sent me a message that he thought would interest me. We're both big EQ2 fans and he had some interesting news to tell me, which was cool he took the time to made sure I knew! Knew what? LoN was included in the SOE welcome back program. EQ and EQ2 accounts (upon logging into LoN) get a free LoN (Legacies) choose your loot card. Very good news indeed! I logged in later on and had a chance to see all what was available, it was a tough choice with all of the cool loot but as I was thinking, just the other day, a New Halas home would be great to decorate... Well I picked New Halas Housing License! Gorgeous house- FREE and Rent Free! On my EQ account I grabbed a really nifty mount. 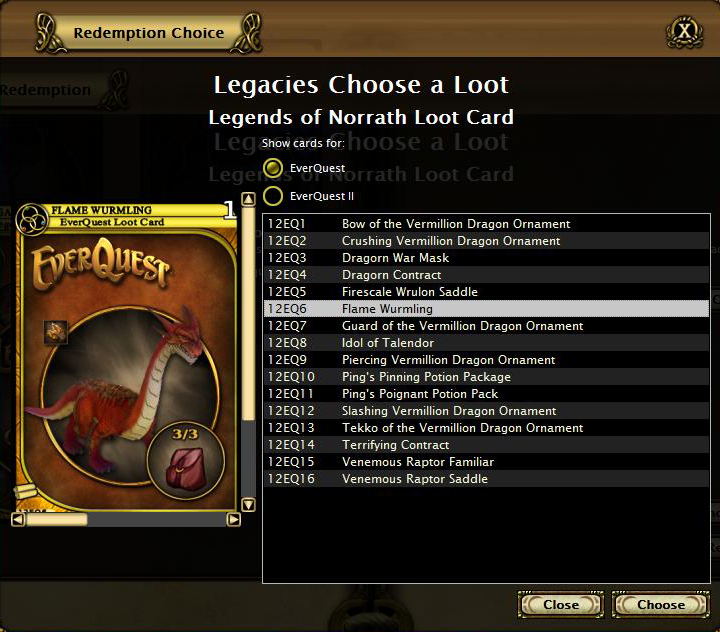 So, all you EQ and EQ2 players check LoN for your loot card. I had around 18-20 LoN packs to claim also. 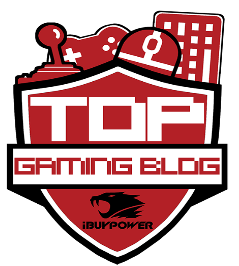 Some great things available to you for free. 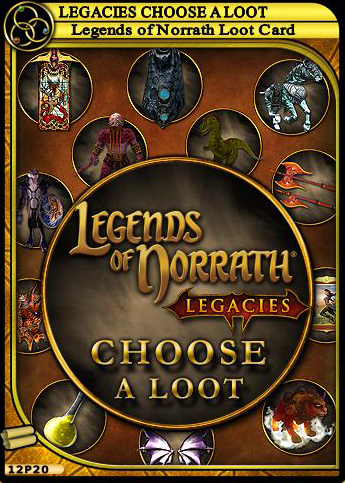 I saw people asking, on the EQ forums, for a free choose your loot card from LoN, many thought the EQ WB rewards were a bit meh, so maybe this will help sweeten the deal! It is one claim per station account so pick wisely! Included at the bottom are shots of the loot lists available for each game! Also- Thought I'd add this in. 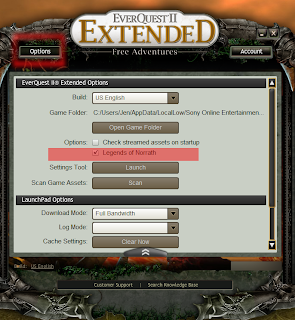 You don't have to download LoN to log into it this game, you can do so by logging into it with EQ or EQ2. 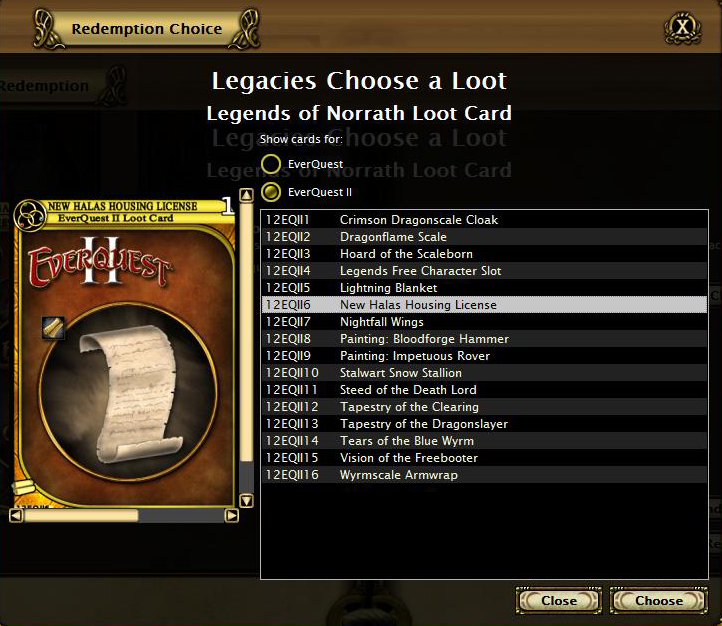 Simply click on the EQII or EQ menu and select Legends of Norrath in the list. 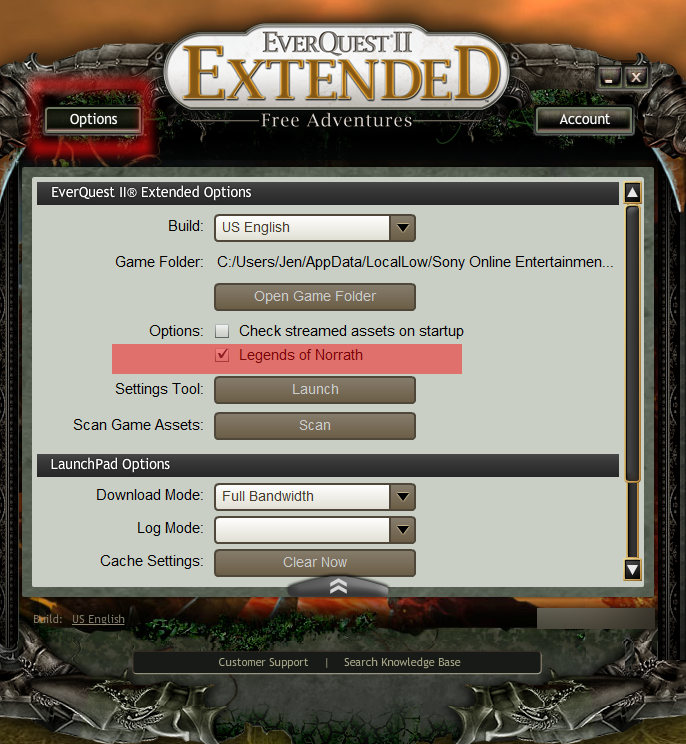 If it gives you an error about installing it (EQ2) you simply log out, go into the launcher, options, select Legends of Norrath and then back to the main login screen- Click: Update. Below is a picture to give you the gist of what you'll need to do. All separate game launchers should look similar to the picture, if you use the station launcher (which is sort of phasing out for EQ2, I cannot use it any longer) simply do a full scan. However, it should, most likely, be integrated into EQ already. Question: What do you think I should get for EQ2 if I already rent the largest house available in NEw Halas ? The housing is great because it is rent free, and basically free. if you have the same model already you can save the fole (click on the door and save layout) then when you move you can just load up that file to place everything as you had it. I like the wings and the cloaks a lot too. I had to go with the housing since I really wanted a lovely Halas house!